We have sites for any sized RV as well as Kabins, Kottages and grassy tent sites. Our campground is only 24 miles from Glacier National Park. It is located in a secluded valley off the highway just a couple miles from Whitefish and a short drive from Kalispell. Most folks who stay in our campground visit Glacier Park. Fun for kids: We have a large playground, pool, bikes, kiddie paddleboats, petting zoo, mini putting, and a game room. Most activities are free! Your kids will not be bored at the Whitefish KOA. Relax after touring Glacier: Let us handle dinner. Join us at our nightly barbeque. Relax in our adults only hot tub or gaze into the embers of your campfire. Click here for a printer friendly data sheet. 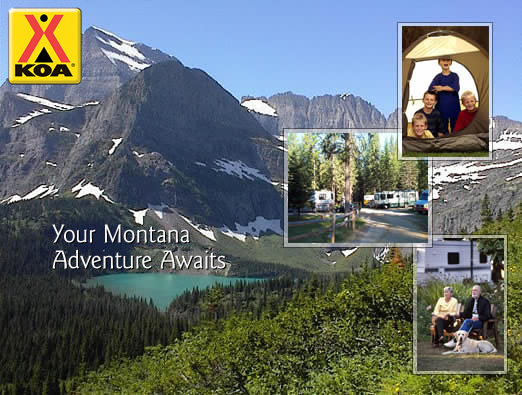 Looking for a campground near Glacier National Park? You've found it! We're near Glacier and a short drive from Whitefish and Kalispell. What will the weather be like during your trip?